The controversy that has arisen from the nomination of Martin McGuinness, as the Sinn Féin candidate in the forthcoming presidential election, contains historical parallels that a student of Irish history will instantly recognise - almost like deja-vu in fact. Shatter's affectionate use of the definite article (she's just not any old queen!) in deference to the head of state of a foreign country is of course highly suggestive of his background and political leanings. It's probably a moot point to ask whether such a display is suitable for a government official making a public statement. 'Failure to embrace' the official visit of Queen Elizabeth II of England (first of Scotland) was not the exclusive domain of Martin McGuinness, or even Sinn Féin, in any case. It is fair to say that the overwhelming public reaction was one of indifference, mingled with dismay at the heavy-handed security presence foisted upon the country during her stay. Presumably too, it would have been Alan Shatter himself, in his capacity as Minister for Justice who would have been instrumental in sanctioning and authorising this. I have spent my life defending this State, and I am not about to surrender it to people who will change it from the inside. What does all this mean? What issues does it raise? In particular, the question arises: How far does he propose to go in his bid to prevent people from 'changing the state from the inside'? Does this not also illustrate the fact that if people are thwarted from changing things by the legitimate route (i.e. from the inside) they will seek (perhaps with justification) to use 'illegitimate' means? While it is funny to observe the hysterical reactions that archaic mindsets can produce, there is a definite historical origin that is worth considering. Fine Gael are the political descendants of those who supported the Anglo-Irish Treaty of 1922, defending it in the civil war which that treaty precipitated. Of all the political forces in Ireland, past and present, they have always taken to heart their self-appointed role as 'defenders of the realm' - more often than not with little or no notion of political irony, let alone a sense of humour to guide them. This oath was a requirement for duly elected TDs to be able to take their seats. In 1927, following the assassination of Kevin O'Higgins, the Cumann na nGaedheal government, under W.T. Cosgrave, introduced a series of repressive measures which were widely unpopular. They also introduced a law requiring all Dáil candidates to promise that they would take the oath in order to contest Dáil elections. It can be seen therefore that Alan Shatter is not the first Irish political leader, who has attempted to make subservience to a foreign monarch a 'suitability criterion' for those seeking public office, even within the framework of a supposedly independent and republian-oriented Irish state. Faced with the options, Fianna Fáil took a pragmatic decision to take the oath (they said that they were doing no more than 'signing a piece of paper'). In any case, the actions of the Cumann na nGaedhael government may well be regarded as a blessing in disguise for Fianna Fáil. By 1932 they were the largest part in Dáil Éireann and in a position to form a government. On 9 March 1932 the first change of government in the Irish Free State took place. Wikipedia provides all the important information as to what happened before, during and after this important transition. All this gave rise to a feeling that the outgoing government would attempt to thwart the democratic wishes of the Irish people. This was the 1930s after all, a time when coup d'état were enjoying a certain currency as the preferred means for thwarting the popular will. It is widely believed that many of the deputies who arrived at Dáil Éireann on 9 March, 1932 to take their seats, entered the chambers carrying guns concealed about their clothing. Whether or not this outcome was solely due to wise and far-sighted leadership of W.T. Cosgrave, or whether a secret deal was struck, history does not seem to record. But given the comparatively seamless transition, it seems entirely likely that something of the sort did take place. It would be strange if it didn't. For Cumann na nGaedhael (soon to become Fine Gael) this would be the beginning of sixteen years in opposition. It is possible however, that from their perspective this too amounted to a blessing in disguise. A bit like Margaret Thatcher's famous remark that her greatest legacy was New Labour, for Fine Gael also, their adversaries enjoyed the popular appeal and grassroots support that they lacked. The irony of this situation became all the more apparent when Fianna Fáil, by taking advantage of the abdication crisis, began a process that appeared to be implementing what Michael Collins had proposed in using the treaty as a stepping stone to freedom. In the period of almost 80 years that ensued, Fine Gael returned to government on only six occasions (a total of about 20 years) and on no occasion did they manage to achieve re-election having served a period in government. They became accustomed to the role of official opposition and occasional seat-warmers, forming stop-gap administrations whenever Fianna Fáil were suffering from periodic bouts of internal division and/or public unpopularity. Whether formally declared or not, this strategy was adhered to by Fine Gael in opposition right up to the present, including almost 14 years of Fianna Fáil government (1997-2011) that for a time coincided with a period of rapid economic growth, only to be followed very quickly by a disastrous economic downturn. In 2008 the global financial crisis struck leaving the Irish state reeling. The unthinkable had happened. In the 2011 General Election the blame game resulted in Fianna Fáil being decimated at the polls. Fine Gael were returned to power but on this occasion it was far from being a blessing in disguise. No more than Lee Harvey Oswald, it wasn't like Fianna Fáil had acted alone. It could be just anger at their own capitulation that is prompting the latest virulent outbursts from Fine Gael, which on a superficial level appear to be directed at Sinn Féin, but could have wider targets in sight. But further appraisal would suggest that there is more to it than that. Fine Gael today are in the position where the chalice they passed to Fianna Fáil in 1932 has been returned to them. It is now a poisoned one but they seem to feel that they have no option but to drink from it. They also expect the rest of the country to follow suit. Hence the none-too-subtle inference in Gay Mitchell's statement that loyalty and fealty to the state is an absolute requirement and not conditional upon the state upholding and vigorously defending the interests of the people. Fine Gael might not even have the luxury of forming a stop-gap administration, until such time as Fianna Fáil is back on its feet and ready to resume the helm. One of the things that this presidential election campaign is strongly hinting at, is that Fianna Fáil's decline may be terminable. For what must be the first time ever, that party failed to field a candidate or even to nominate an independent. In fact mere debate on the issue unearthed deep divisions within the parliamentary party, regardless that their numbers these days are small enough to convene a gathering in a telephone booth. Another notable outcome of the 2011 election was the electoral breakthrough experienced by Sinn Féin, certain left-wing parties and groupings, together with non-party independents. It is clear as day that a major political realignment is on the cards - one based on the notion of competing aspirations rather than the stage-managed punch and judy affairs served up by Fianna Fáil/Fine Gael over the years. While the political forces are currently fragmented, it is likely that they the pace of events will galvanise them into action. It is also quite likely that a central if not core objective of this new political force will be the repudiation of the ECB/IMF dictate. There will be no cloak with which to mask such a deep and fundamental division. So Fine Gael are in a situation roughly similar to that which they found themselves in 1932: facing the possibility of being politically eclipsed; the probability that they are going to have to hand over the reigns of power; not at all certain that on this occasion they will be able to find a 'suitable' successor. In desperation they are trying to rally forces by calling for a joyful rendition of God Save the Queen. But just as in the past, if that is really what they want on this occasion they are going to have to find some way to impose their will upon the country at large. In the world of today it is the institutions of finance capital that are King - faceless entities that have the power to make or break nations. There is nothing that even her majesty, the queen of England could do to stand in the way of such forces, even if she were minded too. So whither Ireland and whither Fine Gael? That party has witnessed transitions before but how will they react to it on this occasion? Will they listen to and accept the democratic verdict of the Irish people or will they attempt to do what W.T. Cosgrave declined to do in 1932? Letter to Morning Ireland: On the Question of Religion in Ireland and the former Soviet Union. The State We Are In. Éire is ainm don Stát. Meditations on politics, partition and football. 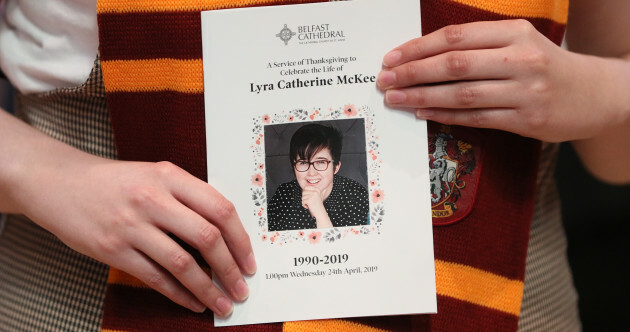 A quiet, reflective and defiant Belfast stands with the McKees as they celebrate their 'wee brainbox' - Lyra McKee is many things to many people now – but today was about her family and their loss. Copyright © Words and Comments 2005-2016. Awesome Inc. theme. Theme images by sndr. Powered by Blogger.